How much is the #ONEKampus+ prepaid starter pack? The #ONEkampus+ prepaid starter pack is FREE for all IPTA & IPTS student nationwide. What will you have in the #ONEkampus+ prepaid starter pack? Each FREE #ONEkampus+ prepaid starter pack comes with preloaded credit of RM6 (valid 30 days), FREE 500MB 4G LTE & FREE 1GB Basic Internet (valid for 30 days) upon SIM activation. When is the redONE #ONEkampus+ prepaid starter pack available? The #ONEkampus+ prepaid starter pack is available from 4 September 2017. Where can I get a #ONEkampus+ prepaid starter pack? You can only register & redeem at selected redONE touch point in the Universities. What is the maximum number of starter packs that I can register? 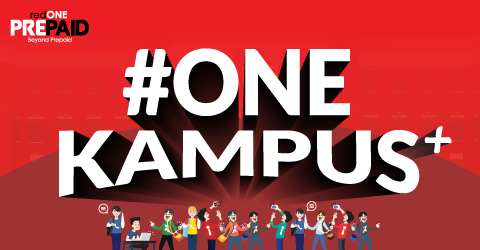 Only one (1) #ONEkampus+ prepaid starter pack can be registered per student. How do I register & redeem a #ONEkampus+ prepaid starter pack? Please bring along your student ID card & original MyKad to the redONE touch point inside your campus to redeem for one (1) FREE #ONEkampus+ prepaid pack. Can I MNP port-in my prepaid line to #ONEkampus+ Prepaid plan? Do I need a new SIM Card when I change to redONE service provider? Yes, you need to change to a new SIM Card. It will be issued to you when you ask for a redONE Prepaid #ONEkampus+ Plan. You will receive the FREE RM5 credit upon successful registration. The RM5 will be credited to your account once you have received the SMS notification. For example, the line was successfully registered in on 8 March 2018. You will receive the first RM5 credit on 8 March 2018. I activated my SIM on 1 April 2018 and reloaded RM10. Which credit will be utilised first? The FREE RM5 credit will be utilised first. Once the RM5 credit is used up, your subsequent usage will be deducted from the RM10 reload. My line is suspended. Can I continue to use my RM5 credit? If my #ONEkampus prepaid sim pack is inactive, can I register & redeem a new #ONEkampus+ prepaid starter pack? No. You are only eligible to register for the #ONEkampus+ prepaid starter pack once. Which data will be utilised first if I reload and purchase Data Top Up? My line is suspended. Can I continue to use my FREE 500MB data? If your SIM is active, you can continue to use your FREE 500MB and any data top up balance quota until the end of the validity period. My line is suspended. Can I continue to make outgoing calls? If your SIM is active, you can only make redONE Prepaid to redONE Prepaid calls. Student can get a new SIM pack or port-in to the redONE Prepaid #ONEkampus+ plan for FREE. There are no charges for #ONEkampus+ Prepaid plan. All the #ONEkampus+ Prepaid packs come with the BONUS RM60 bonus airtime credit (RM5 x 12 months). Celcom and/or Celcom MVNO port-in (MNP) number is allowed but excluded from receiving this bonus credit. The line will be automatically activated when the registration is successful. Student is NOT required to make the 1st call to activate the line. The RM5 bonus credit, RM6 pre-loaded credit, FREE 500MB 4G LTE data and FREE 1GB Basic Internet data will be credited. into the customer’s account when the registration is considered successful after receiving the Activation SMS. The BONUS RM60 bonus airtime credit (RM5 per month x 12 months) can only be used to make domestic voice calls, send SMS, MMS, make video calls, PPU data & purchase Data Top Up. It cannot be used for IDD, roaming and/or for buying mobile contents. Validity of the FREE RM5 bonus airtime credit is 7 days. Unutilised airtime will be forfeited after 7 days. The SIM must be active to receive the FREE RM5 bonus airtime credit. If the SIM is not active on the 1st of the month, the FREE RM5 bonus airtime will not be credited. The first FREE RM5 bonus credit auto reload will be credited upon successful registration and subsequently every 1st of the month for the balance of 11 months. Once the FREE bonus credit is fully utilised or its validity has expired, subsequent usage will be deducted from the available airtime credit. Upon the first call activation of a SIM card, a subscriber will receive FREE 500MB 4G LTE data and FREE 1GB Basic Internet as activation bonus. The FREE 500MB 4G LTE data and FREE 1GB Basic Internet activation will be credited after the customer receives the activation welcome SMS. FREE 500MB 4G LTE data and FREE 1GB Basic Internet data will expire on the last day of the activation month. The FREE 500MB 4G LTE data will be renewed on the 1st of every month as long as the SIM is in 'Active' status. If the SIM is not in 'Active' status on the 1st of the calendar month, the FREE 500MB 4G LTE data will not be renewed until the customer reloads within the same month. The FREE 500MB 4G LTE data will be given only once (1) per month regardless of the amount of times the customer reloaded in a month. The FREE 500MB 4G LTE data will follow the calendar month. Any unused data at the end of the calendar month will be forfeited. The Subscriber must maintain the redONE Prepaid SIM in 'Active' status in order to utilise the FREE 500MB 4G LTE data. The FREE 500MB 4G LTE data will be utilised first before the purchased Data Top Up is utilised. The FREE 500MB 4G LTE data given is non-transferable, whether by operation of law or otherwise, either to any other person, entity or any other Subscriber's prepaid account. The FREE 500MB 4G LTE data can only be utilised within Malaysia only. If you are overseas, roaming charges will be imposed based on the Internet roaming rates set by the respective redONE roaming partner operators. Upon 100% usage of the FREE 500MB 4G LTE Data, your quota will be deducted from any available Reload Bonus Data. If there are no Reload Bonus Data quota available, subsequent data usage will be deducted from any active Data Top Up quota. All redONE Prepaid and Power Bank Bundle 70 comes with FREE 1GB Basic Internet with speed of up to 64kbps. You may continue to enjoy FREE 1GB Basic Internet as long as your account validity is still active. If your account validity is inactive, the FREE 1GB Basic Internet will be temporarily disconnected until a reload is performed. This FREE 1GB Basic Internet will be refreshed on every 1st of the month and a new data quota will be credited into your account provided that the SIM is active. The Subscriber will enjoy the use of FREE 1GB Basic Internet with limited speed of up to 64kbps. This FREE 1GB Basic Internet is herein restricted from consumption of Voice over Internet Protocol (VoIP) and/or Internet Tethering and/or any Peer-to-Peer or file sharing applications and/or other similar heavy streaming services. The FREE 1GB Basic Internet quota granted herein is non-transferable, whether by operation of law or otherwise, either to any other person, entity or any other Subscriber's prepaid account. No carrying forward of the unutilised quota of FREE 1GB Basic Internet is allowed. The FREE 1GB Basic Internet data can only be utilised within Malaysia only. If you are overseas, roaming charges will be imposed based on the Internet roaming rates set by the respective redONE roaming partner operators. Upon 100% usage of the FREE 1GB Basic Internet data, subsequent data usage will be charged at Pay-Per-Use rate at RM0.01 per 200KB. Existing customers whose SIM is in active status will receive the FREE 1GB Basic Internet on the 1st of the month. The ‘unlimited redONE Prepaid to redONE Prepaid calls’ are granted as part of normal everyday mobile voice usage for individual users. This service shall not be re-sold, rented or utilised in any other way except as an individual making calls to other redONE Prepaid users in the course of a normal day’s activities and in line with average on-net call frequency and minutes per month. redONE reserves the right to implement and enforce this policy, and modify or amend this 100 hour threshold if average on-net call volumes across the entire redONE Prepaid customer base increases, or decreases, over time. The Subscriber must maintain their accounts to be in an "Active" status throughout the duration of the services in order to continue enjoying the unlimited calls. The unlimited calls can be utilised within Malaysia only. Calls made while roaming are subject to roaming charges when used overseas. After the FREE 500MB 4G LTE data has been utilised, the subsequent data usage will be deducted from the FREE 1GB Basic Internet data quota. Data can only be utilised within Malaysia only. If you are overseas, roaming will be imposed based on the Internet roaming rates set by the respective redONE roaming partner operators. redONE does not guarantee or warrant the availability of the data usage and the Subscriber(s) acknowledges and agrees that the data usage is provided on an "as is" basis. To experience 4G LTE speed, you must use a 4G compatible device and the data service is used in an area with 4G network. Software and applications which are used by you to send and/or receive, for uploading and/or downloading of files can contain very large amounts of data (e.g. Peer-to-Peer traffic like Bit Torrent or other similar file sharing applications). These software and applications demand a significantly huge amount of bandwidth which will negatively impact the speed and also cause network congestion. As a result thereof, a vast majority of customers will be affected from degradation of the quality of Service, and as such is deemed as excessive usage. Excessive usage can also be caused by spamming, virus activities, spy wares and/or other malwares which may reside in Customers’ Devices. These activities may be known or unknown to you and normally operates in the background of the Devices’ operations. Therefore, you must take all precautions and rightful actions to ensure that the above activities are controlled and minimized at all times. redONE reserves the right to implement and enforce the said Policy at its sole discretion upon occurrence of such activities. The responsibilities and onus of proving shall be on you to ensure that the Devices are free from all viruses, spybots and malwares when using the Service. redONE reserves the right to release any information if it is required to do so by any law, regulatory body or court of law. You will not be able to use the data service if your account is in Grace Period. For clarity, “Grace Period” shall mean fifty (50) days from the expiry of the validity period of your account. You may only continue to use the Internet Service once you perform a reload during the Grace Period. IDD and International Roaming services are available to, and in, most countries. To make IDD calls, there must be credit balance in the SIM. IDD rates are applicable for calls originating from redONE Prepaid subscribers within Malaysia. To make calls and utilise data while roaming, there must be credit balance in the SIM. Calls or data usage while roaming is subject to roaming charges when used overseas. The charges will be based on redONE’s prevailing rates and the roaming country’s rates. For the avoidance of doubt, all mobile data bundles or allowances can only be used domestically within redONE’s network. Please refer to our IDD and all roaming rates. All existing redONE Postpaid customers of any plan are not allowed to migrate to the new redONE Prepaid plan. redONE does not process any Sensitive Personal Data in its ordinary course of business. If the need arises, redONE will obtain explicit consent from the customer before or when it processes Sensitive Personal Data. redONE may process Personal Data without the customer’s consent only in limited circumstances as permitted by law.